Every parent knows that if the kids are enjoying themselves, then life is easier – especially on holiday. Jo Foley reports on resorts with spas which are very family friendly. Bored teenagers, the terrible twos and the whinging in-betweeners can mar any time off for stressed out mums and beleaguered dads – which are why, in so many ways cruises can be ideal for families. However do check that your age group is catered for before you go, as well as your need for a spa! For instance P&O’s Ventura caters for every age group, in separate ways from two to 17 plus there’s the Oasis Spa, while Cunard offers care for the littlest one-year olds as well as fully comprehensive spas. Other lines offer everything from PlayStation marathons to miniature golf and bowling alleys, while others have semi-educational eco and marine courses, DJ and talent contests and Disney offers courses on film-making. All of which gives you a chance to lie back and enjoy a wrap or a massage. On land there is a similar choice with endless offerings including special menus and baby-sitting services. The Forte Village in Sardinia (Above) is renowned for its sports offerings with several well-known professional sporting icons taking part in the various tuition offerings from football to golf, netball and rugby, with a hugely popular Chelsea Football academy. There is always a great turnout for friendlies between the staff and guests, as some of soccer’s big names holiday at the Village too! As for the spa with its 20 treatment rooms and 40 therapists it is one of the best in the Med. Its highlight are the five saline dense thalassotherapy pools set in a tropical garden, you slide into each one in turn with temperatures ranging from 38 deg C to 20 deg C. They are both relaxing and healing – which is why they are popular with damaged sportsmen such as jockeys and footballers who visit them accompanied by their physios. 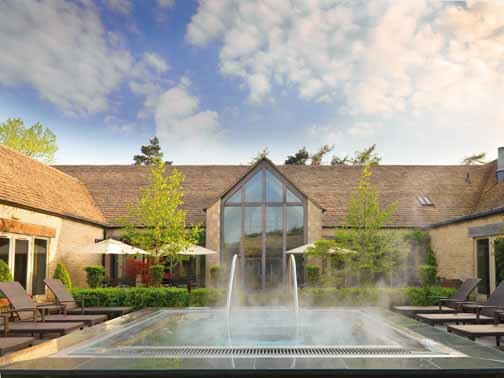 For something a little closer to home head for Calcot Manor(Above) just outside Prince Charles’ home town of Tetbury in the Cotswolds. Dating back to the 14th century this manor has, apart from the main building complete with a serious restaurant, family rooms, cottages in the old stables which are ideal for families, a spa in its own cottage set back from the rest, a Playzone for younger children and the Mez complete with computers, Xbox, and a cinema for the older ones. It has its own pub, the Gumstool Inn for more informal meals – add an outdoor pool, tennis courts and over 200 acres of Cotswold meadowland. Enough to keep everyone happy. The spa, has an outdoor hot tub and a crèche along with a choice of beauty and body treatments. There are special day, half day and weekend programmes while the hotel offers special programmes for half terms, so ideal for short breaks. Searching for the exotic? Then Spice Island Beach Resort in Grenada is the answer. Bordered by one of the best beaches on the island, a long luxurious ribbon of golden sand, the resort not only has the Nutmeg Pod, which caters for 3-12 years olds throughout the day plus baby-sitting services at night, it also has family activities such as tennis, snorkelling, rainforest tours and kayaking plus a super-luxury Janissa Spa. Here, while the rest of the family are occupied, or merely playing in the warm sea, Mum can wallow in treatment cabins enjoying sea mud wraps, aromatherapy massage or a simple pedicure. After which the family re-groups for fun in the sun.